We offer the best in Tap, Jazz, Ballet, Pointe, Lyrical, Contemporary, Musical Theater, Hip Hop, Baton, and Acrobats. Robinson's was founded in 1971 by Lynn Sanders Robinson. Her daughter, Kelly Robinson who is the current owner. Robinson's is home of the award winning "Lynn Robinson Dancers" who have won many local and national competitions across the United States. The Lynn Robinson Dancers have performed on the Disney Cruise Line "The Oceanic". as well as have landed on the T.V. Show "Oxygen". We are happy to announce that we now have three convenient locations: Saraland, AL., Bayou La Batre, AL., and Pensacola, FL. Highly trained and experienced teachers work with each dancer in classes based on age and skill level. No matter if you are a beginner or advanced dancer, we have a place for you. Our audition only, award winning competition dance company, "The Lynn Robinson Dancers" travel around the area competing at the local and national level. Robinson's prides itself on an award winning baton program. The Robinettes march in parades and compete at the local and national level. We are still accepting registration! Come by or call the studio Monday through Thursday from 4:00-8:00p.m.! Call 251-675-5915 for more information! 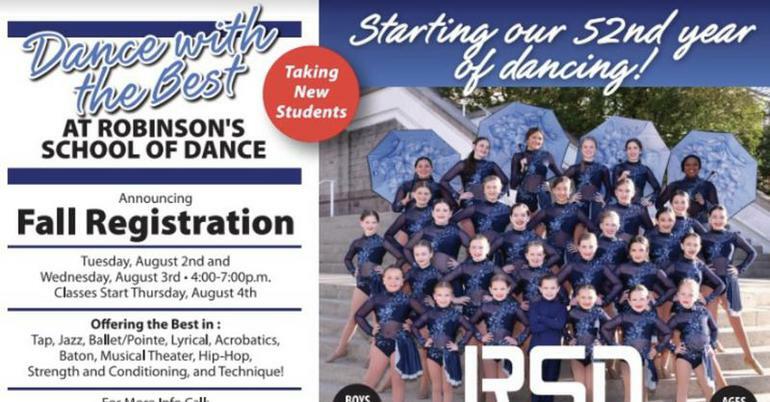 Check us out on Facebook at Robinson's School of Dance! Studio Closed for Spring Break April 15th-19th 2019! Last day to order a recital t-shirt is Monday, April 29th 2019! Recital Rehearsal Friday May 10th Mobile Civic Center Theater 3:30p.m.